1L year can be a very stressful time for just about anybody. With a diverse graduating class of 2017, students come from many different walks of life. Some students came to UConn Law directly out of college while others have children and are just now beginning their careers. No matter where we all came from, we all knew law school would be tough. We probably did not realize that 1L year would force us to really prioritize what was important to us, and drop doing anything that wasn’t. I don’t know about my fellow classmates, but I was pretty surprised about the things that I held on to. Many 1Ls seem to have little, if any, spare time however many are involved in some fun activities while others stay practical and take it easy. 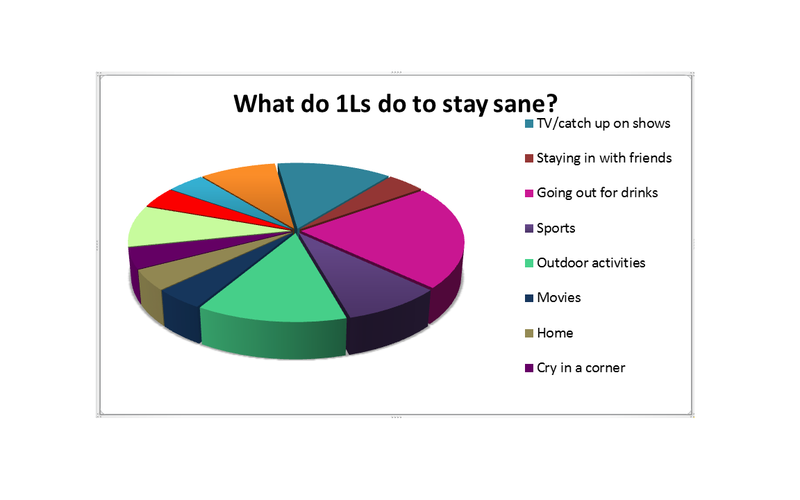 According to a poll of 1L students, free time activities range from taking weekends off to go skiing to watching a favorite TV show. Some 1Ls prefer to go out for drinks with friends whenever possible, while others prefer to stay in and get a good book in. Outdoor activities and sports are also popular. For instance, some 1Ls have found solace in yoga with Corrina on Wednesday nights and the various kickball tournaments have provided others an outlet for their competitive nature ¾ such as the PAD v. PILG kickball game this month, which P.A.D. won. People have even found the time to take road trips or go shopping. And of course many 1Ls have reportedly taken their free time to sit in a corner and cry (although I believe that statistic is somewhat underreported). Whatever the case, 1Ls have adapted to their newly laborious and hectic time schedules to fit in time for fun, and we are all happy to report that we are staying sane!